The original World Cup trophy was stolen?! The World Cup trophy that we see now is in fact not the original trophy that was used when the tournament was first started. The original trophy was actually called the Jules Rimet Cup, named after the president of FIFA that set up the first tournament in 1930. The original trophy was given to Brazil permanently in 1970 after they had won their third title. It was unfortunately stolen however in 1983, when thieves broke into the Brazilian Football Confederation headquarters in Rio de Janeiro. When was the current trophy introduced? 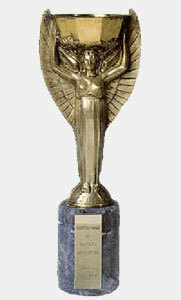 The current trophy was commissioned after Brazil won its third title in 1970 as replacement to the Jules Rimet Cup. Designed by Italian designer Silvio Gazzaniga the new trophy weighs in at over 13lbs, and is 75% 18 carat gold. The winner of each tournament has their name engraved on the base of the state, with suggestions coming that a new statue may be required when this space is exhausted, sometime after the 2038 World Cup. 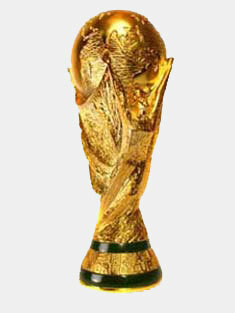 This trophy was first presented to Germany upon winning the 1974 World Cup. Currently, new FIFA regulations state that the cup must stay with the federation, with the winning countries only receiving gold plated replicas rather than the solid gold original.